Hi there! It's good to be back from our little spring break trip and I'm excited to share a card we made at last weekend's stamp-a-stack. This card uses the sneak peek Four Frames stamp set. This set will appear in the next Idea Book and Catalog, but you can purchase it this month, along with the Paisley Prints designer paper (which I also used on this card). WARNING: This paper is absolutely gorgeous! For more information on how you can get your hands on these goodies, visit my demo web site. This month's theme was "Spring Fling" and all of our cards focused on springy colors, flowers and butterflies. I really like that little butterfly accent on the frame, made with the Beautiful Wings embosslit. 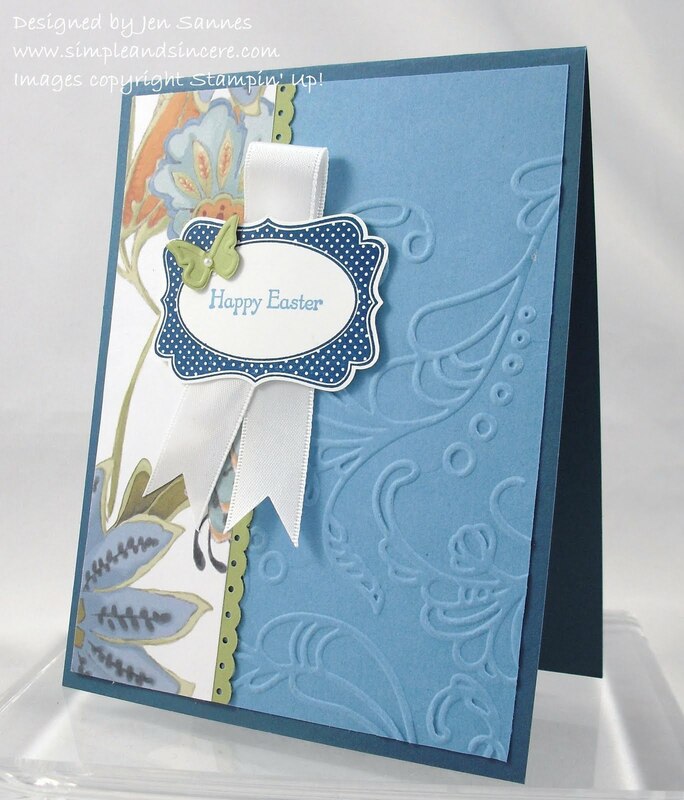 This is a pretty card that works for Easter, but would also work as a sympathy, wedding or even birthday card, just by switching up the greeting. Have a super day! See you soon! Fantastic card! I love the dp and embossing!